On Dec. 1, 1914, a 17-year-old teenager from Travis County took the train from Austin to Tyler and enrolled at Tyler Commercial College. More than a half-century later, leaning back in the chair of his book-lined office while vigorously twiddling his thumbs on an ample belly, Granddad told me that TCC is where he learned to type. He acquired that skill on an Oliver, a machine Grandad said the college touted as �the finest typewriter there ever was or would be.� Oh well, no business school could be expected to get everything right. Founded in Chicago by Thomas Oliver in 1895, the company produced the nation�s first �visible print� typewriter, meaning the typist could see what he or she typed while typing while hitting the keys as opposed to other brands where the text could not be viewed during the typing process. While its product might still have been considered the state of the art in 1914, it went out of business in 1928. Well, at least in the U.S. A British company bought the company and continued to produce Olivers in the UK until 1958. No matter the brand of typewriter he used, knowing how to type would prove to be of vital importance to Grandad, who went on from the business college in Smith County to a long career as a newspaperman and freelance writer. While Granddad had become pretty good at telling stories on a typewriter or in person, other than laughing over the school�s belief in the future of the Oliver typewriter, he never had much to say about the time he spent nearly a century ago now in East Texas. Knowing him and the times, I imagine he boarded at one of several rooming houses near the college. He had earlier aspired to be a preacher, so he likely didn�t pose school staffers any disciplinary problem. For reasons he never explained to me, he stayed in school less than a year. But what he learned about business must have been enough, because by the summer of 1915 he was publishing a weekly newspaper he had started at Big Lake out in West Texas. And thanks to TCC, he could type the articles he wrote -- on an Oliver or some other machine. Granddad never got around to telling me any of his experiences in Tyler, but TCC had the reputation of being one of the best business schools in Texas at the time he attended classes there. In 1914, the college already had more than 10,000 alumni. 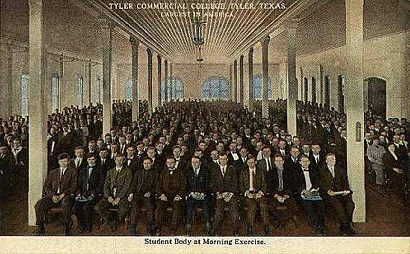 The history of the college dates to the late 1890's, when C. L. and Lockett Adair moved Whitesboro Teachers Normal College from Grayson County to Tyler and merged it with Tyler College. Soon Henry Edwary Byrne and Frank A. Glenn joined them in the venture and the college grew rapidly in enrollment. TCC students attended classes in a three-story 50,000-square foot building built a decade earlier after fire destroyed the college�s first building in Tyler. 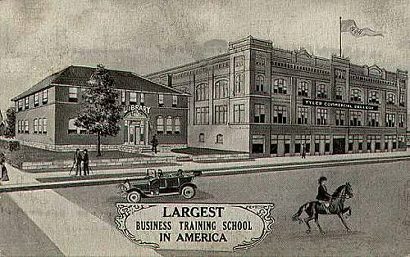 According to a 1914 postcard featuring TCC, the college was �The Largest School of Bookkeeping, Business Training, Shorthand, Steno-typwriting, Typewriting, Cotton Classing, Telegraphy, Business Administration, and Finace in America.� It had 2,000 students and 20 teachers. �Positions secured�Prepare to raise your own salary,� the advertising piece offered. Those attending TCC didn�t spend all their time sitting in a classroom or studying. Every October, seven traincars of students went from Tyler to Dallas for the annual TCC Day at the Texas State Fair. Later, well after Granddad had moved on, the college developed a well-respected petroleum geology department, world-renowned cotton grading department, and a radio station so students could learn about broadcasting. The college kept churning out students during the East Texas oil boom of the early 1930s and saw even more students when it offered defense-related instruction during World War II. The school stayed downtown until 1956, when the Rutherford Metropolitan School of Dallas bought it. New owner Tracy Rutherford moved the college from its 1904-vintage building to a facility on South Broadway, where it remained in operation for nearly another decade before finally closing for good, a victim of the growth of junior colleges and four-year universities. The old downtown building on aptly named College Street was razed in 1965 and a drive-in bank built on the site. Byrne claimed a graduate of his shorthand course would be able to take down words at 150 words a minute or the class would be free. Whether my grandad took that course, which would have been handy for his ambition for a career in journalism, the only way I ever saw him write anything down was the old-fashioned way. Maybe Granddad thought being able to type was good enough, which for him it turned out to be.